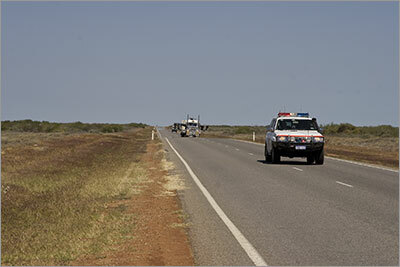 With the winds blowing from the south we reluctantly left Carnarvon knowing we were in for a hard ride south. Not long ago we were complaining about the heat, now it’s the wind and we expect it won’t be long before you find us commenting about the rain as there seems to be a lot of that down south. We rode out of town along the HMAS Sydney II Memorial Drive. 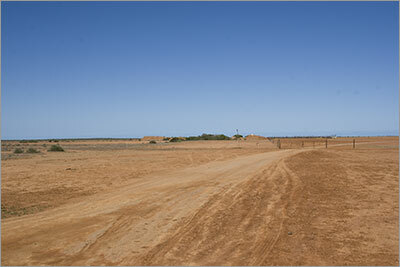 This is a stretch of road between Carnarvon airport and the North West Coastal Highway where a palm tree has been planted for each of the 645 men lost on the HMAS Sydney off the coast of Carnarvon more than 60 years ago. Although the majority of these palm trees are still only small they would be the last trees we would see today with the country being very open. The highest bush would be about 2 metres and these are very rare. Our breaks today were very short as the flies were out in force. They stuck to us like we have never seen before. For those who do not have a beard let me tell you that flies crawling through a beard is something you are not missing out on. Although we have had the fly nets out before this was the first time I would use it every time we stopped. I got so used to it that during lunch I would have to keep reminding myself I had it on or I would find myself taking a mouthful of net along with each mouthful of food. Even though the country was covered in very low bushes there were lots of birds calling throughout the day. We saw a number of emus and saw our first flying Bustard or bush turkey. We have seen lots bustards before but they usually just turn their back and walk casually away as we approach. Until now we thought they could not fly. At lunchtime we discovered we had walked our bikes into a patch of 3 cornered jacks and all 6 tyres had them sticking out, luckily when we removed them all the tyres stayed up. For the rest of the day we would scan the ground ahead for 3 cornered jacks each time we pulled off the bitumen. After only 65 km riding into the wind we called it a day and found a camp on the side of the road near a fence line. After putting up the tent we observed that all the tyres had a very impressive collection of 3 cornered jacks. This time as we removed them we heard the dreaded “shhhhhh” coming from one of the trailer wheels. Luckily all the other tyres remained up. When I repaired the tube I found 3 holes in it. This is our first official puncture of the trip. It was a very cold evening with both of us digging out long trousers and jumpers. Our lunch stop. We discovered as we left we had walked into a patch of 3 cornered jacks - luckily we had no punctures - on this occasion. Oversized vehicles image 1 of 3. 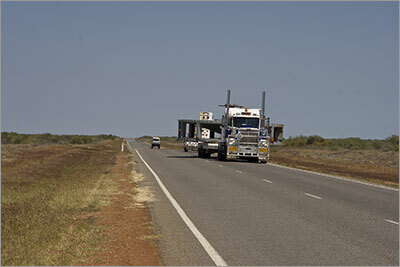 There are a lot of oversized vehicles on the North West Coastal Highway. We usually stop to take a photo. This particular instance gave an interesting sequence of pictures. Oversized vehicles image 2 of 3. Oversized vehicles image 3 of 3. 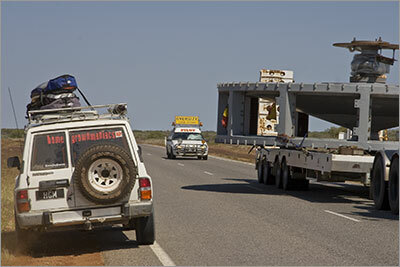 As we stopped, as you are asked to do by the pilot, this 4WD slowed behind us and as the truck passed the 4WD squeezed by. We stood there shaking our heads. The pilot following shook his head. When I looked at the photo the 4WD's number explains it all - HGM - the red writing on the window says - "Home Grown Maniac". Does this driver specialise in being stupid?